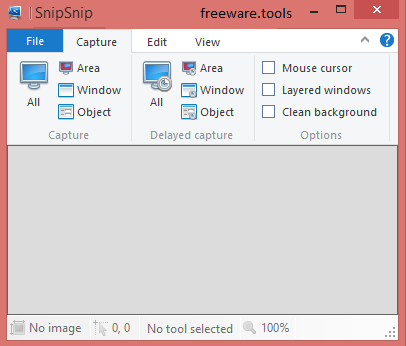 SnipSnip Portable is a screen capture utility, designed for easy capture of some or all of your screens. It also allows you to do simple tasks like resizing, cropping and drawing on the capture. It can also clean the background of transparent windows. SnipSnip Portable supports saving the capture to the following formats like bitmap, graphics interchange format, Jpeg,Portable Network Graphics, and Tagged Image File Format. As implied by its name, the utility is a portable one, meaning that you do not need to install it on your computer to enjoy its functions. There is a reason people say that an image is worth one thousand words - sometimes, the best way to send a message is by using a picture. And the same thing applies to making a demonstration on your computer, as it is best that you take snapshots to make a point, rather than spend a lot of time with explanations. SnipSnip Portable is one of the numerous apps that can help you take such screenshots. The interface is as straightforward as it can be, and you only need to choose the capture type before taking your first snapshot. The available options are full screen, a desktop area, a window or an object. You can grab the desktop as soon as you press the associated hotkeys, or you can rely on the delayed capture. However, the only way to define the delay interval is to access the Options window. Once you have taken your snapshot, SnipSnip Portable allows you to customize it to your liking by cropping, rotating or flipping it with a single mouse click. Moreover, you can add a text message to any location you specify, then select the font type, size, and color. You also get to add rectangles and ellipses to your snapshot, along with freehand drawings. When you are pleased with the outcome, you can export the result to PNG, JPEG, GIF, BMP or TIFF files, to the output folder you specified. Additionally, SnipSnip Portable makes it possible for you to save automatically the snapshots and to assign them filenames according to the pattern you define. All in all, this application is a nifty solution for taking several types of screenshots, altering them with various tools, then exporting them to chosen formats.